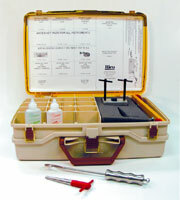 The Valentino Deluxe Repair Kit is an invaluable tool for band or orchestra directors! The top section includes a brass repair kit containing stuck slide tools, water key corks, a mouthpiece puller, a mouthpiece truing tool, and other brass accessories. The lower section includes a complete woodwind repair kit with cork grease, key and tenon corks, and pads for flute, clarinet and saxophone.